Spring is here and it’s time to gear up for summer fun! And really, whose plans don’t include the beach? Everyone loves the sun, the sand, and the surf. Plus, the beach is a great place to spend time with family and friends to enjoy those hot summer days and long summer nights. This is a very busy time of year for Long Beach Island, as businesses, restaurants, and home builders are all preparing for a great summer season! During this time our phones are really busy with home buyers looking for advice and properties on the island to build their dream custom home. 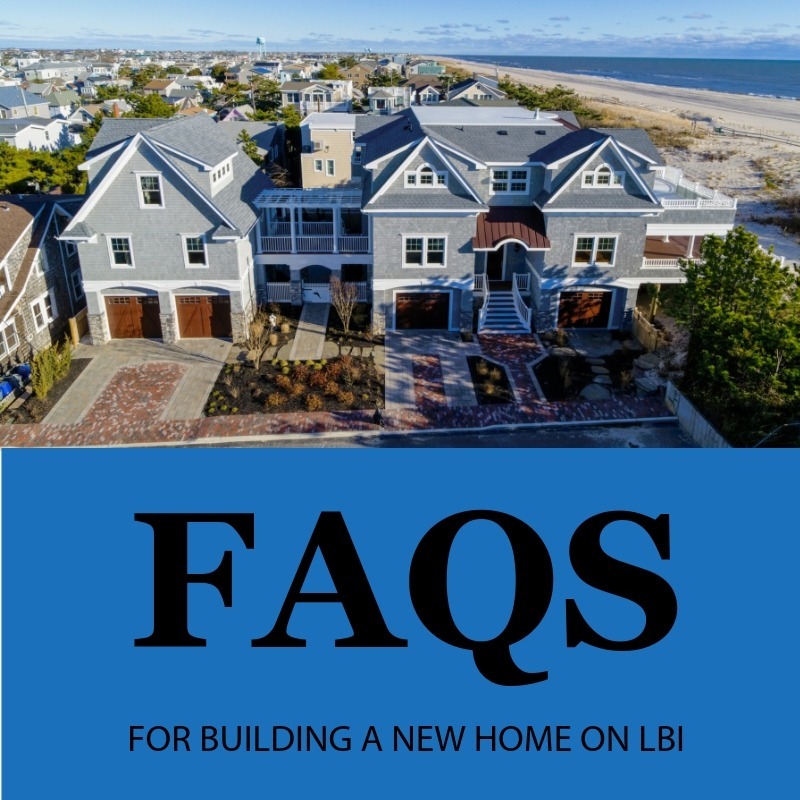 We thought it would be helpful to put together some of our frequently asked questions for building a new custom home on LBI. Why should I find a property and start building now? We get this question all the time, but spring is always the strongest time of year for buying and selling homes. You’ll find more properties on the market this time of year than any other season. With summer coming upon us, owners will be looking for quick closings, and buyers will benefit by being able to start demolition on the existing home while the weather is good. Many of our homeowners purchased their properties prior to contracting us to build their new home. But, some of our homeowners needed our help to find that perfect location. If you are looking and need some help, let us know, we’re happy to find the property you’ve been looking for! What do I need to know when buying a property? Prior to purchasing a property, you will need to know what the setbacks are. A setback is the minimum distance which a building or other structure must be set back from the street, road, river, flood plain, or any other place which is deemed in need of protection. These vary from town to town. Many times home buyers need our help to figure this out so that they understand where their home would need to be located on the property prior to construction. Do I need to have a home design? This is a great question that almost everyone asks. The short answer is no. You don’t have to come with a home design or architectural plans in hand to have us build your new custom home on LBI. In our experience, we have designed homes for some of our homeowners. For others, they came to us with plan, and we built from the provided plans. Other times we have taken our homeowner’s plans and reworked them based on the property the home is to be built on. No matter what your design situation is, we can help take the vision for your new home and make it a reality. Can I talk to some of your past customers as references? Any builder should give you a list of references from past customers so that you can talk to others who have gone through the building process. The best measure of the quality and reputation of a home builder is what their previous customers think about their experience building their new home. We are proud to say that many of our homeowners are happy to talk to other families interested in building with us. Since we have been building custom homes on Long Beach Island for over 20 years, we have quite a list of homeowners to share with our future homeowners! If summer life on LBI is for you, spring is the time to act! There are a lot of properties on the market, and building your own custom home can be a very rewarding experience. Our team specializes in building custom homes on LBI. Contact us today to find out how to get started today.